Superman is having a rough time in comics lately. In an attempt to make the character feel more human, he’s lost some of his power, he’s been exposed to the world—but the excellent “Young Superman” anthology series American Alien shows Clark’s humanity in a real, earnest way by examining his formative years. 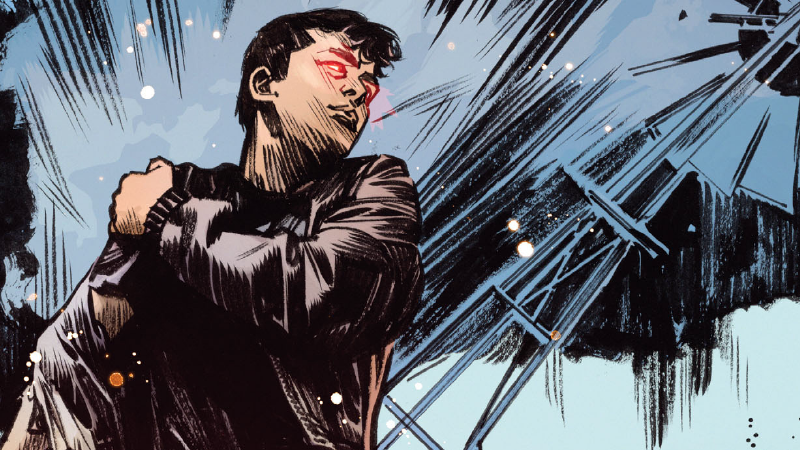 Spoilers ahead for Superman: American Alien #2, by Max Landis and Tommy Lee Edwards. The second issue of American Alien moves on from the young Clark Kent we saw learning to fly in the first book to giving us a slice of an optimistic, bright little boy. As a teenager, Clark is, outwardly, totally different. He argues with his parents. He flirts with girls. Hangs out with friends he probably shouldn’t hang with, drinking beer he definitely shouldn’t be drinking. He even admits to using his X-Ray vision to take some cheeky looks at people. This is the Clark we witness throughout much of this story—not a hero, just a boy, a teenager. And yet, it’s fascinating that threaded through all that normalcy there’s an essential Superman-ish qualities that shines through in Landis’ pitch-perfect characterisation of Clark—combined with the sketchy brilliant linework of Tommy Lee Edwards, whose masterful shading gives each character, and the environment of Smallville a lived-in, darker aesthetic that perfectly fits the tone of the story—that makes this sullen teen still feel like the wide-eyed kid with acceptance issues that we met in the first issue. He might not be it yet, but at this character’s core is the element that will turn him into the Man of Steel. That really comes into play when Clark is deeply thrust into the dark underbelly of the story. A small gang of drug-dealing criminals returns to Smallville for a spate of bloody crimes—a cop shot on the outskirts of town, an innocent family executed in a gas station—and eventually to take the family of said gang’s leader, Owen, hostage. At first, Clark tries to stay out of it, to keep himself away from the police, even when the Sheriff (who knows that Clark is an alien) begs him for help. But that desire to do good can never really keep him away—even though it has some pretty disastrous consequences. Clark goes to confront the gang, and in the process, gets shot at, revealing his impervious skin. And in a moment of anger and fear, his heat vision bursts out—gruesomely slicing the arms off one of the crooks. In the fallout of the incident, Clark lashes out at both the Sheriff and his adoptive mother, in typically teenaged fashion—crying out that maybe he shouldn’t be protected, because he’s dangerous and can defend himself, running off when Martha Kent offhandedly remarks that she just wants her son to act like a “normal human teenager”—as he tries to reconcile the innocence of his desire to do good with the tumult of emotions and anger inside him that drove him to do what he did. It ultimately ends with Clark reconciling on the roof of the Kent farm with his mom, thankful that even with the way it turned out, even how it made him feel, glad that he saved people’s lives. It’s a painful, relatable vulnerability that totally works for Clark in a way that his current adult version just isn’t getting. It makes you understand the person he will grow up into. It makes him feel human in a way that current Superman stories aren’t quite hitting the mark. Turning the current Clark Kent into a lesser Superman doesn’t make him appear more human to his readers. But examining this young, fragile Clark as he gets to grow up, come into his powers and ultimately his heroic identity, does—we’re seeing a human turn into a superhero, rather than a superhero being made human. It’s far more fascinating, and so far, it’s making American Alien the only must-read Superman comic that DC have right now.